Tabuk — White and brown merged into one color as snow covered the desert sand in central and northwestern regions in Saudi Arabia after temperatures dropped below zero degree Celsius. In the central city of Shakra and the northwestern city of Tabuk, thin layers of snow carpeted the ground. 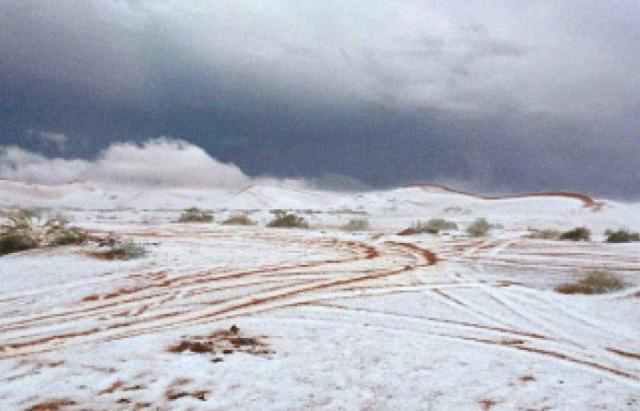 In Tabarjal, a town located in the northern Al-Jawf region temperatures reached -3 degree Celsius, and in Al-Quryat, a northern province, the temperature was -1 degree Celsius. While mid-October usually marks the short-lived peak for Saudi Arabia’s rainfall season, the Kingdom is still experiencing light to medium showers. He said this is “the second rainfall this season,” even though 40 days have passed since the end of rain season. — Reprinted with permission of the Saudi Gazette.